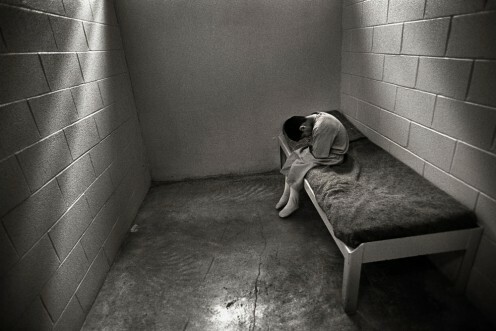 Solitary confinement is a form of imprisonment in which an inmate is isolated from any human contact, with the exception of members of prison staff. In India, maximum period of solitary confinement is 3 months and it shall not exceed 14 days at a time. Relevant provisions of solitary confinement are sections 73 and 74 of Indian Penal Code, 1860.
a time not exceeding three months if the term of imprisonment shall exceed one year. In executing a sentence of solitary confinement, such confinement shall in no case exceed fourteen days at a time, with intervals between the periods of solitary confinement of not less duration than such periods: and when the imprisonment awarded shall exceed three months, the solitary confinement shall not exceed seven days in any one month of the whole imprisonment awarded, with intervals between the periods of solitary confinement of not less duration than such periods. As per Supreme Court “Right against solitary confinement” is one of the rights that falls under Article 21 (Right to Life) of the Constitution. Supreme Court held that solitary or single cell confinement prior to rejection of the mercy petition by the President is unconstitutional.